I went to see ‘Flags of Our Fathers’ with Tung and Fabricio one night after work a few weeks ago. 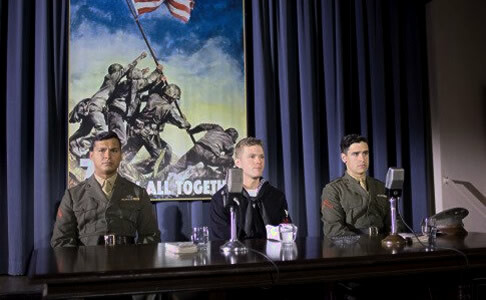 This Second World War epic is the latest piece of work to come from critically acclaimed director Clint Eastwood, and centers itself around three men and the controversy that surrounded the famous photo ‘Raising the Flag on Iwo Jima’. This film has a large American historical context, so perhaps a lot of this film’s relevance may have been lost on me. However, regardless of the story it was trying to tell, the fact is that there seemed to be very little—two flags were raised, and many of the men who were responsible for getting both of them atop Mount Suribachi were killed in action, and weren’t able to see the response and publicity that this single image generated back in the US. Eastwood tries to get around this problem, by endlessly playing with the timeline, going back and forth, from the field of action (which to be fair contained cinematography equally comparable to that of Saving Private Ryan), to the three surviving soldiers enrolled by the Government to travel around the US on the back of this photo, to promote war bonds, whilst at the same time fighting each other and their own demons. Whilst the film contained a number of fine performances (especially from Adam Beach who played conflicted soldier Ira Hayes) there seemed to be very little plot—which I very much doubt was actually the case. The overly complicated yet essentially simple story-line, made film flabby, tiresome and easily forgettable as a result.